Would you like a fun ready-to-create paper project to come to your doorstep each month? My Paper Pumpkin, new from Stampin Up! is just such a product. It arrives with some paper fun that is perfect for beginners or those short on time! It also makes a great gift for those who might be interested in creating but don’t have the time to create projects from scratch. Each month you'll receive a unique, surprise kit with all you need to complete a papercrafting project. It may be cards, journals, decor, or something else! Each kit includes stamps, ink, paper, and accessories. All color-coordinated, measured, and cut just for you! All you need to supply is adhesive. Depending on your skill level and experience each kit will take about 30 minutes to complete. Your Paper Pumpkin will be shipped on or around the 15th of the each month and you need to sign up on or before the 10th of the month to receive a kit that month. Even though My Paper Pumpkin is a monthly subscription there's no commitment. You can cancel your subscription at any time. In addition you can skip a month. Each kit will contain 1 or more unique stamps and 1 or more ink spots (a tiny ink pad) that you will be able to add to or begin a collection of stamping products and use them over and over again on other projects. No matter when you sign up the first kit you will receive will be the Welcome kit. Among other things it contains a clear block for you to use with the stamps in all the future kits. The Welcome kit and contents are shown on the back of the current catalog. (Click here to see) To show you some ideas for your Paper Pumpkin Welcome kit I made two cards. Until August 31 new subscriptions to My Paper Pumpkin are half price for the first two months. They are regularly $19.99 a month, which includes shipping. During this promotion they are $10 for each of the first two months. If you like the original project for the kit and want to make more, you can generally duplicate the project with regular Stampin’ Up! Products. I duplicated the components that came in the Welcome kit with the products I had on hand and duplicated the project. I make a few changes in the original design of the card in the Welcome kit so that you can also see that the projects can be put together in many different ways. Here is my first card - my CASE (copy and share everywhere) of the Welcome kit card. I will show you the second card in my next post. OK I realize may have gotten carried away with the Spot stamp – but you can see that the card is very similar to the original card shown in the kit. Here is how it was made it. The card base is Basic Gray cardstock. So Saffron ink was then sponged onto a Whisper White layer which was then stamped in Basic Gray ink with the Hey There Friend and spot stamp. The large green circle was punch out with the 1 ¼” scallop punch and then placed by in the punch and rotated a fraction of an inch and punched again. This creates more of a jagged edge. The green piece was then embossed with the polka-dot embossing folder. The small green pieces are ½” circles and the flagged strip is a piece of So Saffron that was embossed with the Stylish Stripes embossing folder. The button is a Very Vintage button sponged with Tempting Turquoise ink. (Yes the buttons can be colored with ink! It was left to dry overnight.) Linen thread was tied through the button holes. If you sign up in August your first kit the Welcome kit will cost $10 (including shipping) and will ship around September 12-14. Your second kit will be the October, will cost $10 (including shipping) and it will ship around October 12-14. Your third kit will be the November kit. It will be full price ($19.99) and ship around November 12-14. If you don't want the November kit, you need to cancel that kit (set the quantity to zero) sometime after your October kit ships and before November 10. To give you an idea of what to expect here is a summary of the kits for each month so far. March - Welcome Kit pictured on the back of catalog. 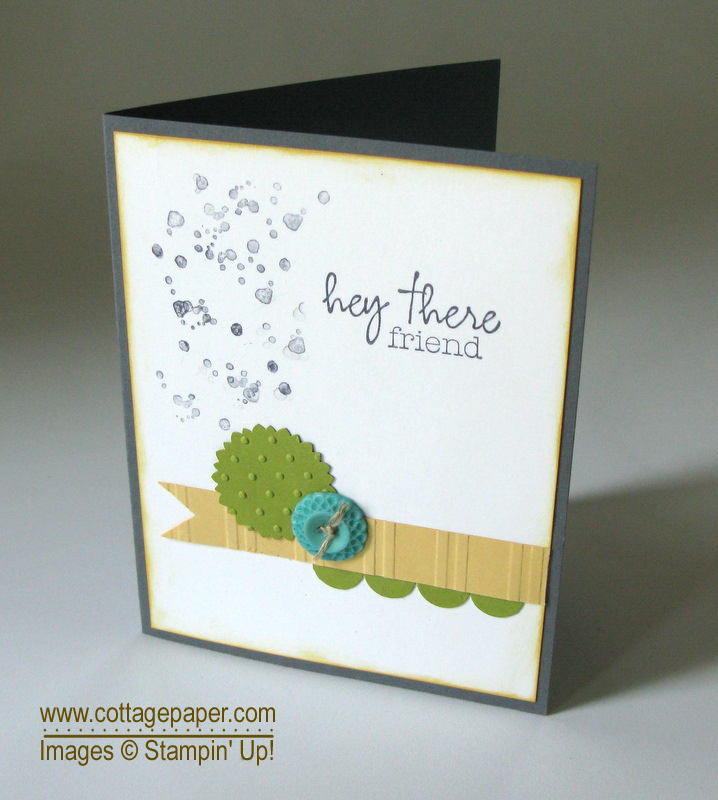 It has the Hey There Friend stamp, a Basic Gray ink spot, Clear block D, embellishment pieces, cards and envelopes. April – Seriously Kit. It has stamps which say Seriously, You Kick Booty, and Love Your Guts plus a Cherry Cobbler ink spot, embellishment pieces, cards and envelopes. May – Good Life Brag Book Kit. It has stamps which say The Good Life and an arrow with the words Love This plus a Basic Black ink spot, front and back chipboard covers, printed pages, sticker sheets, embellishments and metal rings to assemble. June - Hello to You Kit. 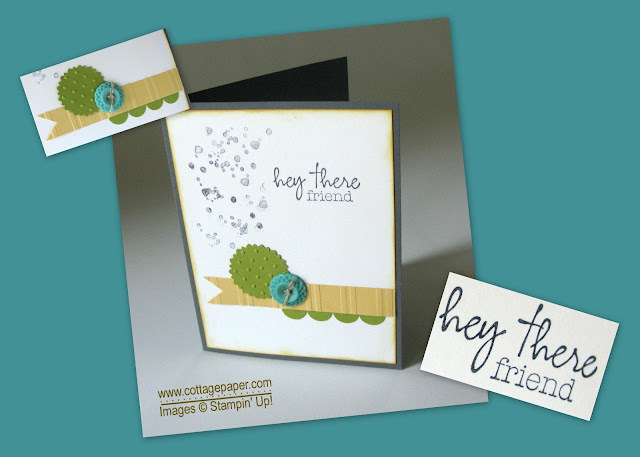 It contains the Hello to You, Heart and Chevron Stamps, a Soft Suede ink spot, punch-outs, embellishment pieces, cards and envelopes. July – Party Pennants (mini banner) Kit. It contains Polka Dot, Small Honeycomb and Diagonal Strip background stamps, Pool Party and Summer Starfruit ink spots plus lots of punch outs to make banner. August – Pedal Praise Kit. It contains a bicycle and Thanks So Much stamp, Baked Brown Sugar and Bermuda Bay ink spots, punch-outs, embellishment pieces, cards and envelopes. If you want to sign up click on the My Paper Pumpkin kit on the right column. Be sure to enter promo code PUMPKINDEAL. You will need to choose a demonstrator and if you don’t already have one I would appreciate your choosing me. lso please let me know by email as I am not notified by Stampin Up! until your kit ships. Please email me with any questions or ask them in a comment below.